HARRY SAMUEL BICKERTON BRINDLEY was born at Handsworth near Birmingham, in September 1867. His father who was one of the oldest and most respected engineering instructors of the Japanese, placed him in the Japanese Imperial College of Engineering, which afterwards became the Tokyo University, and was staffed at that time by some of the finest European engineering professors. After leaving the Tokyo University in 1883, he served his apprenticeship at the works of Messrs. Tangyes, Ltd., of Birmingham, and remained there until 1888, when he held the post of senior draughtsman and was engaged in the hydraulic department. 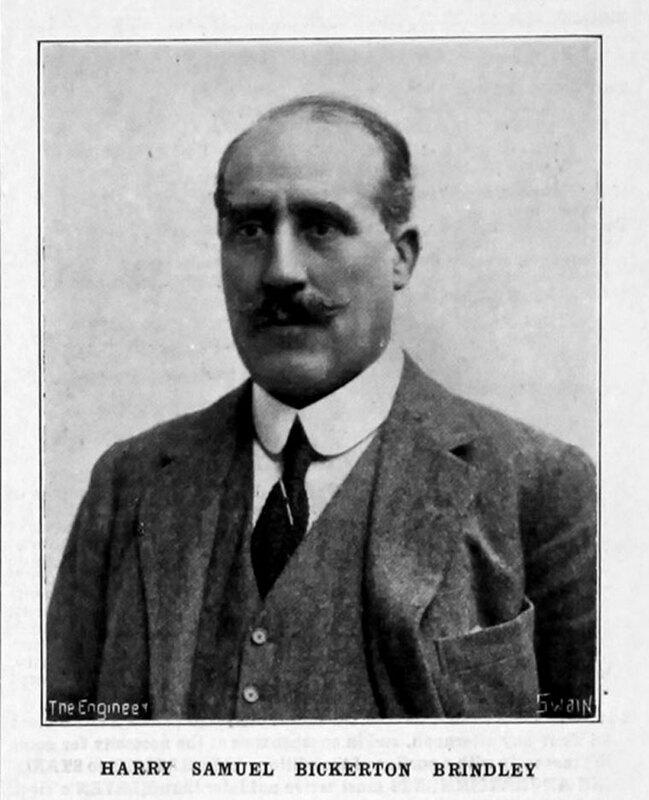 In the same year he designed and carried out important engineering work in connexion with projectile and gas vessel plant, and solid-drawn tube mills, for another Birmingham firm. From 1889 to 1893 he was with Messrs. Thomas Firth and Sons, Ltd., of Sheffield, as engineer, and was associated in the design of their 3000-ton forging plant and new gun shop, and was in charge of their shell department. During 1893 and 1894 he was manager for Messrs. Henry Berry and Co., Ltd., hydraulic engineers, of Leeds, and from 1895 to 1907 he was consulting engineer and technical representative in Japan, where his work consisted largely of the design of hydraulic machinery, and of business between British firms and the Japanese Government. In 1907 he started as a consulting engineer in Westminster, and acted for the Keihan Electric Railway Co., of Japan; he was one of the few Europeans allowed by the Japanese Government to hold the position of Japanese Patent Attorney. In 1914 he gave up consulting work and joined a firm of pump manufacturers, but when war broke out he gave up everything else to take charge of the Ponders End Shell Factory, which he created in the face of enormous difficulties. He reorganized the whole system of manufacture and production, and demonstrated to the British Government and the older established shell manufacturers, how speed and efficiency could be enormously increased and cost greatly reduced. After the armistice he took into partnership Mr. E. T. Elbourne, and the firm devoted its attention to the propagation of the principles of rapid and effective engineering production. His death took place in Westminster from pneumonia on the 28th March 1920, in his fifty-third year, and he was gazetted as a Knight of the Order of the British Empire two days later. He became an Associate Member of this Institution in 1898. This page was last edited on 11 June 2015, at 19:39.